1786----PRESENT (AND STILL GOING STRONG). 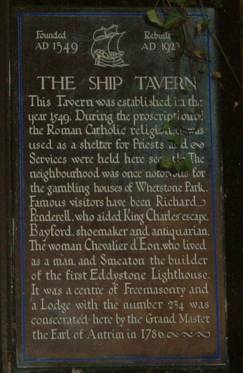 The sign at the "Ship Tavern"
A sincere thanks to all of you who have taken the time to visit our website, "thanks". There follows a short account of Domatic Lodge's history. Much more may be found from the Lodge's History Books, as detailed at the end of this article. Many explanations have been given for the meaning of the name, 'Domatic’. Our research points to an old Scottish word, simply meaning, “Practical” and when applied to a brother meaning “Practical Stonemason”. Originally then, Domatic was a Practical, or more correctly an Operative Lodge, as initially all its Brethren came from mostly the building trade. The preparatory work for founding the Domatic Lodge was begun by Worshipful Brother Fenwick and Worshipful Brother Sinclair of Middlesex Lodge No. 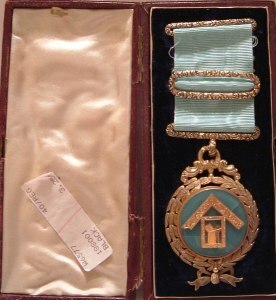 143 and Kent Lodge No. 15 respectively, which, in Masonic terms, would be called our ' Mother Lodges'. The lodge was consecrated on 7th February 1786 as Lodge number 234 in the minutes of the "Antient or Atholl Grand Lodge", at the "Sign of the Ship" Inn which overlooked Lincoln Inn Fields, Holborn, London. This public house is still there but now as "The Ship Tavern" in Gate Street, Holborn, just around the corner from Grand Lodge in Great Queen St., and close to Holborn Underground station. There is a plaque fixed to wall stating that a Lodge was consecrated there in 1786 by the Earl of Antrim with the number 234. Because of certain 'number juggling' that went on in those days, it was not until 1863 that you first see our present number, 177. On visiting the "Ship" you will realise by its size that as the Lodge numbers quite quickly increased it was not possible to remain there and the Lodge therefore moved twice within the next few months ending up in the "Sign of the Sun," also in Gate Street. 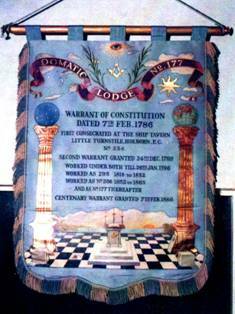 Due to pressure to accept what we now call speculative masons as members rather than operative only, the lodge applied for a second warrant which was granted in December 1789. Holding two warrants at the same time is still an event unique to English Freemasonry. However, it eventually became unworkable to hold two warrants and in 1796 the second was sold off for £1, and was used to start a new Lodge, "The Lion and Lamb", which, as Domatic, is still doing well today. Domatic Lodge is very lucky to possess the original Minute Books, going back to its origins, which is quite a rare achievement, considering the amount of times the Lodge has moved and the many Secretaries it has had over the Lodge's considerable life time. 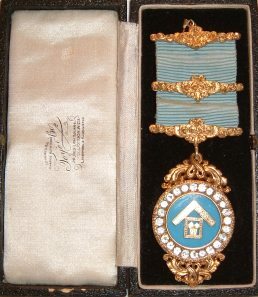 Also at Grand Lodge are some of the original Collar Jewels, which can be viewed on another page by clicking on the link on the left hand side of the page. The lodge has met at many venues during its life, one of the more well known probably being the "Hercules Pillars" in Great Queen Street, (Opposite Freemasons' Hall). The Lodge moved there in 1813, the same year as the Act of Union between the Antients (Ancients) and the Modems. Whilst at this location it's an amazing fact that because of the differences that had occurred before between the Antients and the Moderns, Domatic gave a voluntary contribution to the purchasing of the two original buildings forming the now Freemasons Hall! When this is combined with the fact that we were also involved with the purchase of the London Masonic Centre at Clerkenwell Green, London, we have yet another unique situation for a Masonic Lodge. Considering the investment in these two buildings, in purely business circumstances, I suppose we would be looking at quite a healthy return on our money by now! However, the shares are purely for the upkeep of a non profit making organisation, thus giving no monetary return. Here are a few items of interest, drawn from our history of more than 229 years. The original Initiation fees were 2 Guineas which would equate to £260.00 in 2010 and the subscriptions were 2d.-less than 1p per meeting. By 1837 the Initiation fees were 4½Guineas (£4.72½ p) and the subs 1 s 6d, 7½p. In 1845 while meeting at the Falcon in Fetter Lane, for twenty four members and fifteen visitors the house bill was £6 18s Od. (£6.90p) which equates to £560.00 in 2010. In November 1883 the Lodge received a telegram of thanks from the Grand Master the Prince of Wales, later to become King Edward VII in response to birthday greetings from the Lodge. In February 1886 the Centenary meeting was held at the "Criterion Restaurant", Regent Circus where there were 99 members and a total attendance of 207 Brethren. Out of nineteen different meeting places, the longest the Lodge has remained at any one venue was 75 years at "Anderton's Hotel", Fleet Street, between 1864 and 1939. Many years more than some Lodges have existed! We now meet at Freemasons Hall. Great Queen Street, Holborn. this will now be our home due to the demise of The Central London Masonic Centre, in Lever Street, Islington. After the Second World War finished in 1945 the Lodge membership rose to 85 full members and 55 country or non dining members. Domatic Lodge has had 257 Masters to the present time. In 1986 our Bi-centenary year, the Master of the Lodge for that year was W.Bro Len Grimaldi, which was the last time we had a Grand Officer as a member of the Lodge. This meeting was held at the "Cafe Royal" and approximately 250 brethren were in attendance. To date Domatic Lodge can boast in its “Family Tree” the creation of over 70 Lodges. Domatic Lodge remains one of only approximately 130 "Atholl or Antient Lodges" still in existence. As I stated at the beginning this is just a short history of Domatic Lodge and I would like to say that I was responsible for most of the information herein, but I have to confer that distinction on the late W.Bro Freddie Knights, a fifty year long member of the Lodge of which there have been a few. Indeed we have one at the moment, but he wouldn’t thank me for mentioning his name! W.Bro Fred was also part of the only occasion when three generations of a family have all been Masters of the Lodge. His father Arthur, himself and his son Douglas. Finally I would like to finish by saying two things. 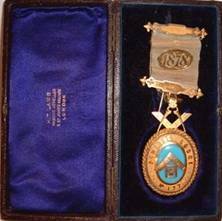 Firstly at a March meeting in 1996 I was one of a total of eleven Brethren in the temple at the Abercorn Rooms, the Great Eastern Hotel. We then went on to sit eight at the festive board, two of whom were guests and one was a visiting Grand Officer! There was no need for formality, we just sat round a table and chatted. Things had got so bad with diminishing membership, that I remember discussing with W.Bro Jeff Harvey, whether we should hand our Warrant back to Grand Lodge. THANK GOD WE DIDN'T. We now have 40 plus members and our numbers are increasing nicely. We have 40 plus at regular meetings and double that at Installations. And secondly many years ago there was tell of a brother who came on horseback from Bournemouth to a meeting taking two days just to get there. So please may I never hear how difficult it is to get to meetings nowadays! (n.b.) If you wish to purchase a book on the History of Domatic Lodge, or enquire about membership of this Ancient Lodge, please contact the Treasurer or Secretary by clicking on one of the links opposite. The Lodge is also honoured in having at least three books published by very well known authors, they are, “History of the Domatic Lodge, No. 177. London, 1786 to 1886", written for the Centenary Festival, 12 February, 1886, by George Blizard Abbott, London. “A Brief history of the Domatic Lodge no. 177. 1786-1936" by Bro. L. R. E. Jennings a member of the Lodge, and, " Freemasonry in London from 1785 seen through the Ancients Domatic Lodge No. 177 and its associates", by Roy A. Wells.